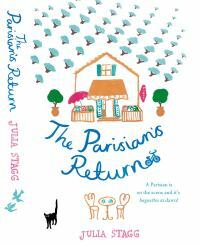 Another great read for me this summer was the second book set in the Pyrenean village of Fogas, The Parisian's Return , by Julia Stagg. This book continues on immediately where L'Auberge finishes. I liked that it did this; firstly as all my favourite characters are still there and secondly because there was so much more I wanted to know about life in the village. It is all change in Fogas as the focus shifts off Paul and Lorna (the owners of the auberge) and almost immediately we meet a new character ‘Le Parisian’ and to say things don’t go to plan for him straight away is a bit of an understatement. His presence is not initially welcome, especially as he wants to make changes. Change is often difficult to accept and especially so when it happens in the heart of the village at the bar/epicerie. It takes the locals some getting used to, although little by little he gains their respect. Things are also changing for Stephanie, as she tries to get her new business off the ground, but with the distractions of a bit of love interest and a few mysterious happenings, things don’t go to plan for her either. The other new character makes a much more understated entrance into the village, but is no less integral to the story. I found there to be a greater sense of community in this book than in the first, with less ‘political’ bickering (which I know to be a common element in French village life). There is a real pulling together, especially at the end when there is drama and a real danger threatens the safety of some of them. French village life may not have the excitement of city life, but there is never a dull moment in Julia’s village. I can’t wait to get back to Fogas and read book three, to be published next year. Same village, same characters, but someone else’s story to be told. To read my review of L'Auberge see here. Julia's books are published by Hodder Paperbacks and available in paperback and ebook format from all good booksellers and online. Here is the Amazon link.